I am assisting my pastor in a series of sermons on the messages to the churches in Revelation in connection with the lectionary reading from Mark for the day. So far it’s been a fascinating intertextual experience! 8“And to the angel of the church in Smyrna write: These are the words of the first and the last, who was dead and came to life: 9“I know your affliction and your poverty, even though you are rich. I know the slander on the part of those who say that they are Jews and are not, but are a synagogue of Satan. 10Do not fear what you are about to suffer. Beware, the devil is about to throw some of you into prison so that you may be tested, and for ten days you will have affliction. Be faithful until death, and I will give you the crown of life. 11Let anyone who has an ear listen to what the Spirit is saying to the churches. Whoever conquers will not be harmed by the second death. My main point was that in order to be ready to suffer faithfully, this church had escaped the temptations of the two cousins Moralistic Therapeutic Deism and Civil Religion. The former was documented as the religion of most American teens (and, I would suggest, adults) by Christian Smith and Melinda Lundquist Denton in their 2005 book Soul Searching: The Religious and Spiritual Lives of American Teenagers. Of course I had to show how a form of this disease already existed in the first century in the sacrificial systems meant to keep the gods blessing us with fertility, prosperity etc. As for civil religion, that was the imperial cult. There is a god who created the world, looks down on us from heaven with a smile, wants to bless us, wants us to be good to ourselves and kind to others, is there for us when we are in a jam, and promises us a place in heaven if we are good. There is a god who created the world, looks down on our country (fill in the blank) with a big smile, has blessed us more than any other nation, thinks our values are his values, wants to expand our influence around the world, wants us to be good to our friends but helps us defeat our enemies, and expects us to love our country as a way of loving God. Revelation is a manifesto against TMD and Civil Religion. Thank God (literally) for the new little (in size, not impact) book by Allan Bevere, a Methodist pastor with a Ph.D. in NT from Durham (England), called The Politics of Witness: The Character of the Church in the World. 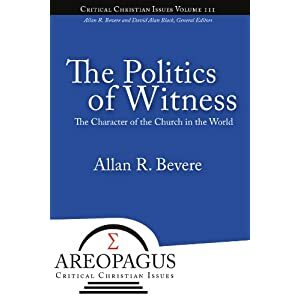 Allan Bevere has written a timely, eye-opening, and thought-provoking book for Christians, whether they consider themselves conservative or progressive. He calls on us to forsake the seductive, insidious error of Christendom and civil religion in order to follow Jesus and bear witness to the reign of God. May this book contribute to the renewal of the church for the sake of the world and the glory of God. After numerous conversations with my pastor and occasions when I shared your words and those of others, as well as my reflections on other churches, this July 4 Sunday  was different at my church. My pastor did not lead a pledge to the flag and made no reference to the flag. He wished the congregation a pleasant holiday, and included in the prayers those who are ill at home and abroad in various capacities, and did use as a recessional hymn one verse of Eternal Father. That was it, and I was so proud of him for his willingness to change after 11 years of pledging and hauling out the flag [emphasis added]. The pastor was concerned that some in the congregation would take him to task for not doing the flag thing, but it seems that no one said a word, at least not yet. My response was, not surprisingly, “Hallelujah!” Both this student, for such a witness, and this pastor, for such courage, deserve our admiration and gratitude. I had a delightful time in the hills of Pennsylvania last Thursday giving the annual ecumenical lecture at Mt. Aloysius College in Cresson, PA. It was called “A More Ecumenical Paul: The Jewish, Catholic, Reformed, Orthodox, Pentecostal, Anabaptist (and more) Apostle” (the more was meant to be open-ended, but I ended up focusing on Paul the ecologist). We looked at texts that highlight themes from Paul that have been especially noticed by these various traditions in order to see Paul more as a contributor to Christian unity-in-diversity. We ended with some common, and some not-so-common, themes that emerge from these texts. Although/because Cresson is super-rural, this small Catholic college draws people for this event from a 50-mile radius or more. Among those in attendance were the current and soon-to-be-appointed Catholic bishops, the Lutheran bishop, the Brethren in Christ Bishop, the Presbyterian presbytery exec, and a whole lot of other really fine people. The spirit of ecumenical openness and cooperation was palpable. Of the various seasons of the church, Lent is probably the least exciting to some people. It is famous as a time of somber reflection and (probably more notably) a time to give up something you enjoy, supposing somehow that it is good for you to go without, to fast, for awhile. We take our cue from Jesus’ 40 days in the wilderness without food or water, a time where he was subjected to temptation prior to beginning his ministry. The text on Sunday was from Luke 4:1-13. We are told three specific temptations Jesus is faced with at the end of his fast, when he’s at his weakest. Each of these temptations is a literary foreshadowing of events in Jesus’ life when he will be tempted again to acheive victory through normal understandings of power. I love John Milton’s Paradise Regained which offers some neat insights and imaginative understandings of the text. Milton sees the temptations of Jesus as the crucial point in his ministry, where Jesus comes to know fully his own divinity; everything after that flows from this full knowledge of who he truly is and what he is called to do. Later on in Luke 9, Jesus sees this temptation again in the form of the feeding of the 5000. For me, the neat thing is that Jesus distributes the food through the disciples, using them as the instruments for feeding the world. It’s an example of God’s economy, Jesus using little to accomplish something that seems impossible. Perfect divine power. Jesus doesn’t use the opportunity to take over, or let others try to convince him to do the same. Satan, in the Milton example, is trying to convince Jesus what he needs to do in order to keep people following and listening to him. But we see in the end that even feeding them does not convince them to stay with him. Temptation #2: The offer of the kingdoms of the world. Jesus is here offered the chance to take over the government and thereby bring God’s kingdom to earth in an authoritative way. The parallel for the church is obvious, that we are offered and tempted for the chance to reform the empire as a means to achieve God’s work in the world. But just as Jesus rejected the kingdoms offered to him, we the church must also reject the temptation to believe that we can bring the kingdom of God through the government. Jesus’ way is the way of death, of weakness and rejection. We must take up that cross daily (the word “daily” is added in Luke’s Gospel from Mark’s). Milton sees this temptation as the temptation to overthrow Rome on behalf of the Jewish people. The fascinating thing about Milton is that his Satan is acutely aware that the restoration and salvation of Israel from Roman Empire is an important part of Jesus’ mission, but his temptations are temptations to not use his divine power (the way of weakness) to achieve the ends. Luke’s answer to this temptation is in Jesus’ anti-triumphal entrance into Jerusalem, where Jesus creates almost a farce of a coup d’etat, coming in on a donkey. Temptation #3: Jesus taken to the temple and tempted to jump off and be saved by the angels. Again Milton’s theme that the temptations are really about Jesus coming to know his own Messiah-ship appears. Thou chance to dash thy foot against a stone. Milton makes the drama about whether or not Jesus can stand at the very top of the temple. For Satan, Jesus seems trapped. Either he falls and forces Jesus to put God to the test and is therefore saved, or Jesus dies/isn’t saved and his own faith in who he is called to be is in jeopardy. But Jesus does the miraculous thing and stands on the pinnacle of the temple, a tiny point. Luke re-visits this temptation when Jesus hangs on the cross and is jeered to save himself as to prove who he really is. And here too is our challenge, for how many of us have given in to the compromising culture around us. As a church, we’ve married the state, we’ve given in to the temptation not to bear our cross, to die with Christ. And so, Lent is a witness for us about the way of Jesus. It is a witness to the world that we begin the journey to life (Easter) through death. It is no mere 40 days of giving up a pleasure, but a radical outward symbol of the type of discipleship we are called to. Lent is an inward journey as much as an outward journey. The death to self, culture, and all other temptations is given the promise of new life with Christ. For us to know our true identity in Christ is to face ongoing temptation to believe that salvation is found elsewhere, that life is found elsewhere, just like Satan attempts to cause Jesus to doubt his own Sonship in Paradise Regained. Jesus’ nonviolent, subversive, seemingly-weak-but-divinely-powerful way of being and doing in the world is the major theme and lesson for us during Lent. 1. Jason Brian Santos, A Community Called Taizé: A Story of Prayer, Worship and Reconciliation. InterVarsity Press, 2008. ISBN13 978-0830835256. 2. Kathryn Spink, A Universal Heart: The Life and Vision of Brother Roger of Taizé. SPCK/GIA, 2005 . ISBN13 978-1579995683. 3. Brother Roger [Schutz] of Taizé, The Sources of Taizé: No Greater Love. GIA G-5363. ISBN-13: 978-1579990862(ISBN10 1-57999-086-X). 4. Marcello Fidanzio, ed., Brother Roger of Taizé: Essential Writings. Orbis, 2006. ISBN13 978-1570756399. 5. Taizé. Seeds of Trust: Reflecting on the Bible in Silence and Song. GIA, 2005. GIA G-6719. ISBN13 978-1579-995386 (ISBN10 1-57999-538-1). In addition to normal academic requirements (analytical essay, research paper, book review), students will use Seeds of Trust and the CD for daily prayer, visit a Taizé prayer service, and write about these experiences. I thought I was done blogging about Bishop Tom for a while, but then the big news came out today: he is headed for St. Andrews University in Scotland as Research Professor of New Testament and Early Christianity. Both the University and the Diocese of Durham released statements today. The good Bishop said it was the most difficult decision of his life (other than turning down the offer we made a few years back ). In my conversation with him in Chicago, he dropped a hint in this direction, but I think most people are quite surprised. I know he is sad to leave the ministry in Durham, but this move certainly feels (w)right to me. Why? He will now have time to actually get some writing done! (It’s about time.) No more slouching! Seriously, he will be able to continue his pastoral writing, increase his scholarly output, and guide graduate students. In fact, I know that some people already inquired today about the Ph.D. application process at St. Andrews for the fall and learned that it is closed! I’m sure this was well planned. Tom joins some interesting people at St. Andrews (which has a very strong biblical faculty and is currently rated the top school in theology in Scotland), including Philip Esler, Trevor Hart, and Alan Torrance not to mention Richard Bauckham (emeritus) (RB has moved to Cambridge in retirement), plus a young American gospels scholar, Kelly Iverson, a good friend of my colleague Chris Skinner. Bishop/Professor Tom will be 62 in the fall—still a young and energetic man, with many productive years left, we hope and pray. (His colleague C.K. Barrett at Durham, who is 92, remains active to this day as far as I know.) May the next phase of his scholarship and ministry be blessed. What do others think of this development?